One of the challenges of modern material science is to create artificial structures whose unconventional mechanical response can be programmed by suitable design of their geometry or topology. Such structures termed mechanical metamaterials can fail in controlled ways or direct sound propagation. In this talk, we discuss metamaterials that exploit topologically protected mechanical states whose spatial extent can be tuned from localized to extended by progressively closing the acoustic gap of the bulk structure. These robust states of motion or stress can be inserted at desired locations by including suitable lattice defects in analogy with their quantum counterparts. The continuum elasticity of the resulting structures can be captured by non-linear field theories with a topological boundary term. 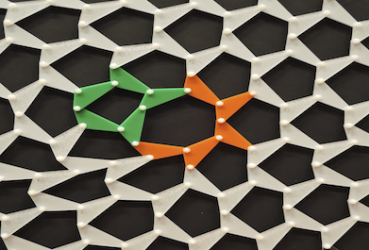 The topological design rules we discuss in this talk will be brought to your fingertips using live demonstrations with macroscopic prototypes based on origami-like and cellular structures. Our work raises the enticing possibility that, once activated by motors or external fields, similarly designed topological mechanisms could be used as building blocks for molecular robotics or information storage and read-out.